And other weird things I’ve learned just in time for the holidays! 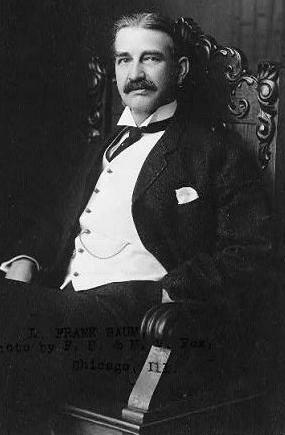 Seriously, though…I was reading A Kidnapped Santa Claus, this fantastic short story written by beloved Oz author L. Frank Baum way back in 1904. It takes place in Laughing Valley–Baum’s alternative to The North Pole–which happens to be surrounded by mountains where there happen to be cave dwelling demons, lurking and sulking and plotting to ruin Christmas. It is like How the Grinch Stole Christmas meets The Nightmare Before Christmas with a dose of The Wizard of Oz! I was researching Baum to get handle on the many not-Oz books he wrote when I discovered that he was not only prolific, but he also had multiple prolific pseudonyms. Of seven known pen names, three of them were female. Edith Van Dyne wrote an entire series of Aunt Jane books. He also authored under the amazingly common names Laura Bancroff and Suzanne Metcalf. In addition to these feminine non de plumes he wrote under the far more manly names of Captain Hugh Fitzgerald, Floyd Akers, Schuyler Stunton, and John Estes Cooke. You will also find there a free download of The Christmas Troll , a collection of creepy Yuletide beasts that lurk in the night around this time of year…and I’ll be discussing this folkloric freakery on Coast to Coast with George Noory, this Friday the 23rd at 10pm PST. More on that later! Varla on Coast to Coast! This entry was tagged Christmas, Coast to Coast, demons, Folklore, How the Grinch Stole Christmas, L. Frank Baum, mythology, short stories, The Nightmare Before Christmas, Wizard of Oz, Yule, Yuletide. Bookmark the permalink.